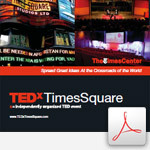 Home » Watch TEDxTimesSquare Online! "The Power of the Pause"
"What is Your Mother Worth?" Global Brand President, Aramis and Designer Fragrances, BeautyBank and IdeaBank at The Estée Lauder Companies Inc.
"Finding Beauty at the Core"
Chairman and CEO of IssuWorks, Former Vice Chairman of The NASDAQ Stock Market. "Capital: The Fuel Behind World Transformation"
"When you are Green You’re Growing"
TEDxTimesSquare is always interested in exciting speakers for future conferences. Please review this brochure and apply here if you are interested. Thanks for watching TEDxTimesSquare! If the video doesn’t load below, please try watching directly on LiveStream.com.